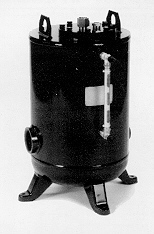 Pressure power pumps have been part of our steam heritage since the early 1900's. Are you tired of paying fulltime crews to repair or replace the same Electro-mechanical pumps over and over? Tunstall Pressure Action Pumps are the maintenance free solution for peace of mind and long term savings. The Tunstall AP-400 Series Pressure Action Pump is the low maintenance, non-electric solution to move condensate or other liquids from low points, low pressures or vacuum spaces to an area of higher elevation or pressure. Condensate can be returned at temperatures well above the 210° F limit of conventional problems. *Series AP-400 available in all stainless steel. Consult Factory. 2" 3" 4" 6" 8" 10"
Note: Inlet reservoir pipe sizing. When draining condensate from a single piece of equipment in a "closed system" to achieve maximum energy efficiency (see Fig. 2-2), a reservoir should be installed horizontally above and ahead of the action pump. Sufficient reservoir volume is required above the filling head level to hold condensate during the action pump discharge cycle. The chart above shows the minimum reservoir sizing, based on the condensate load to prevent equipment flooding during the action pump discharge cycle. Table 4-2 Vented Receiver Sizing for an "open system"
Important Note: Vented Receiver Sizing. When draining from single or multiple pieces of equipment in a "open system", a vented receiver should be installed horizontally above and ahead of the action pump (See Fig. 2-1). In addition to sufficient holding volume of the condensate above the fill head of the action pump to hold the condensate during the action pump cycle, the receiver must also be sized to allow enough area for flash steam and condensate seperation. An overflow could also be added when required. The minimum recommended water seal is 12". The chart above shows proper receiver tank sizing based on flash steam present. 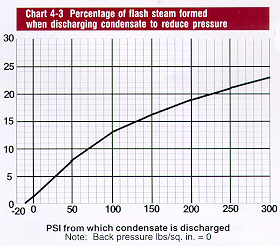 See chart 4-3 to calculate the % of flash steam at a given pressure drop. The non-electric condensate pump shall be Tunstall International AP-400 series operated by steam, compressed air or other pressurized gas up to 125 psig. Electricity, seals or packings shall not be used. AP-400 series body construction shall be of carbon steel and vessel shall be ASME Section VIII "U" stamp coded. Pump internals shall consist of all stainless steel float operated mechanical mechanisms. Motive and vent valve/seats shall be externally removable without removing cap from the vessel body for ease of maintenance and inspection.